(Francisco Kjolseth | The Salt Lake Tribune) Construction at the former Granite Furniture in Sugar House continues at a quick pace as the new Sugarmont Apartments takes shape on Tuesday, May 22, 2018. New Census data shows that Salt Lake City has surpassed 200,000 residents, and again is the state's fastest-growing city by numbers. It added 5,891 residents between July 1, 2016 and July 1, 2017. Spurred largely by population growth, a thriving economy and a flurry of preconstruction activity in its capital city, Utah’s housing stock reportedly grew at the fastest rate in the country from 2016 to 2017, the U.S. Census Bureau said. Newly released Census data indicate the number of housing units in the state grew by 2.1 percent in that one-year period, while Idaho and Colorado saw the second- and third-fastest housing growth rates, at 1.7 percent and 1.6 percent, respectively. The Beehive State added an estimated 22,177 residences over that time, bringing Utah’s total number of housing units to 1,084,631. That figure includes single-family homes, apartments, mobile homes, town homes and condominiums. Despite that trend, demand for homes in Utah continues to push prices inexorably higher. A recently published study found that housing prices in the state have shot up a mind-boggling 3.3 percent annually over the past 26 years, the country’s fourth highest rate. Analysts attribute that trend to a variety of factors, including rising costs of undeveloped land and a shortage of skilled construction workers. The median price for a single-family home in Salt Lake County is now at $345,000, according to data from the Salt Lake Board of Realtors. Utahns’ incomes, meanwhile, are growing at between 2.3 percent and 2.7 percent a year, leaving many — particularly renters and would-be first-time homebuyers — unable to keep up without devoting larger shares of their incomes to housing. Not surprisingly, the Census numbers show much of Utah’s housing growth centered on its most populated counties. Nearly a third of new homes added between 2016 and 2017 — 8,091 units — went up in Salt Lake County and about a quarter of the total — 5,136 — were built in Utah County. Washington, Davis and Weber counties also saw significant shares of the new homes. Slowing-growing Wayne and Emery counties each added 12 housing units in 2016-2017, the Census said, and Garfield and Daggett counties each added six residences. Because those one-year Census estimates are based partly on building permits, Utah demographers warn the statewide and Salt Lake County numbers may be artificially high. (Francisco Kjolseth | The Salt Lake Tribune) Construction at the former Granite Furniture in Sugar House continues at a quick pace as the new Sugarmont Apartments takes shape on Tuesday, May 22, 2018. New Census data shows that Salt Lake City has surpassed 200,000 residents, and again is the state's fastest-growing city by numbers. It added 5,891 residents between July 1, 2016 and July 1, 2017. (Francisco Kjolseth | The Salt Lake Tribune) Construction at the former Granite Furniture in Sugar House continues at a quick pace as the new Sugarmont Apartments takes shape on Tuesday, May 22, 2018. New Census data shows that Salt Lake City has surpassed 200,000 residents, and again is the state's fastest-growing city by numbers. It added 5,891 residents between July 1, 2016 and July 1, 2017. (Francisco Kjolseth | The Salt Lake Tribune) Construction at the former Granite Furniture in Sugar House continues at a quick pace as the new Sugarmont Apartments takes shape on Tuesday, May 22, 2018. New Census data shows that Salt Lake City has surpassed 200,000 residents, and again is the state's fastest-growing city by numbers. It added 5,891 residents between July 1, 2016 and July 1, 2017. (Francisco Kjolseth | The Salt Lake Tribune) Construction at the former Granite Furniture in Sugar House continues at a quick pace as the new Sugarmont Apartments takes shape on Tuesday, May 22, 2018. New Census data shows that Salt Lake City has surpassed 200,000 residents, and again is the state's fastest-growing city by numbers. It added 5,891 residents between July 1, 2016 and July 1, 2017. 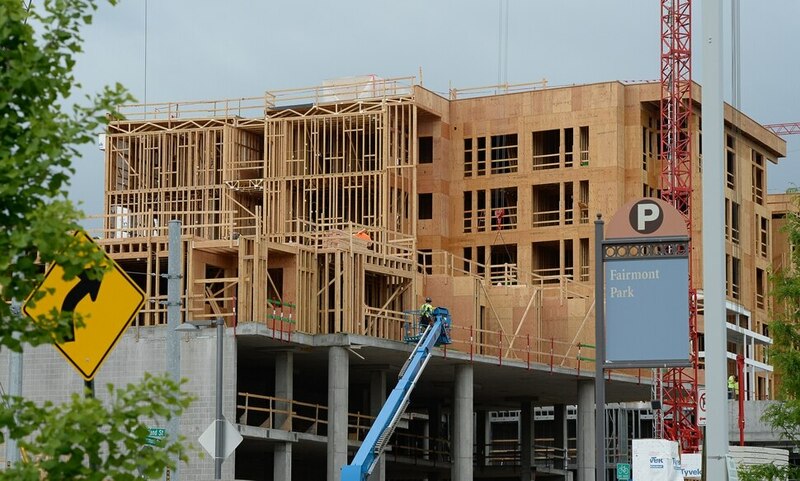 (Francisco Kjolseth | The Salt Lake Tribune) Construction at the former Granite Furniture in Sugar House continues at a quick pace as the new Sugarmont Apartments takes shape on Tuesday, May 22, 2018. New Census data shows that Salt Lake City has surpassed 200,000 residents, and again is the state's fastest-growing city by numbers. It added 5,891 residents between July 1, 2016 and July 1, 2017. (Francisco Kjolseth | The Salt Lake Tribune) Construction at the former Granite Furniture in Sugar House continues at a quick pace as the new Sugarmont Apartments takes shape on Tuesday, May 22, 2018. New Census data shows that Salt Lake City has surpassed 200,000 residents, and again is the state's fastest-growing city by numbers. It added 5,891 residents between July 1, 2016 and July 1, 2017. (Francisco Kjolseth | The Salt Lake Tribune) Construction at the former Granite Furniture in Sugar House continues at a quick pace as the new Sugarmont Apartments takes shape on Tuesday, May 22, 2018. New Census data shows that Salt Lake City has surpassed 200,000 residents, and again is the state's fastest-growing city by numbers. It added 5,891 residents between July 1, 2016 and July 1, 2017. (Francisco Kjolseth | The Salt Lake Tribune) Construction at the former Granite Furniture in Sugar House continues at a quick pace as the new Sugarmont Apartments takes shape on Tuesday, May 22, 2018. New Census data shows that Salt Lake City has surpassed 200,000 residents, and again is the state's fastest-growing city by numbers. It added 5,891 residents between July 1, 2016 and July 1, 2017. (Francisco Kjolseth | The Salt Lake Tribune) Construction at the former Granite Furniture in Sugar House continues at a quick pace as the new Sugarmont Apartments takes shape on Tuesday, May 22, 2018. New Census data shows that Salt Lake City has surpassed 200,000 residents, and again is the state's fastest-growing city by numbers. It added 5,891 residents between July 1, 2016 and July 1, 2017. Salt Lake City saw a spike of permit applications from developers in late 2016 as a city moratorium on charging impact fees was poised to expire. Depending on the project, actual construction can lag a year or more behind when a permit is issued. The jump in permits also coincided with ongoing efforts at City Hall to cut wait times for issuing permits, said Orion Goff, director of its building and licensing services division. By adding staff and new software that processes permits from six city departments simultaneously, wait times have dropped from an average of 114 days in 2015-2016 to 59 days the following year, Goff said. Over the same time period, the number of permits issued jumped from 9,962 to 11,631. In October 2016 alone, the building division issued building permits for 13 new apartment complexes, totaling 1,546 units, Goff said. That rush “significantly inflated” the city’s housing numbers, even though many weren’t built, he said, until the following year. Mallory Bateman, state data coordinator at the University of Utah’s Kem C. Gardner Policy Institute, said despite that permit-to-construction lag, the housing growth indicated by Census numbers is real. And longer range estimates reveal a similar growth pattern. The Census estimates that between April 1, 2010, and July 1, 2017, Utah had the second-fastest housing unit growth, at 10.7 percent, adding 102,548 residences over that seven-year period. Only North Dakota — site of an ongoing oil boom — saw its housing expand more rapidly, at 19 percent over the same period. Utah’s growth, demographers say, is driven by the state’s population trends of relatively high birthrates combined with in-migration. Utah’s job market also continues to expand, with the latest figures in March showing an employment growth rate of 3.3 percent, the nation’s highest.